The treatment lasts for one hour and involves lying on a treatment table, fully clothed, whilst I place my hands on your body. You might feel a deep sense of relaxation and possibly become aware of heat, tingling, pulsations or other sensations. 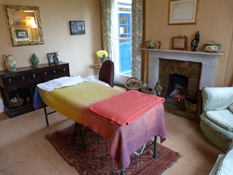 The treatment room at Church Farm. Craniosacral therapy is so gentle it is safe and suitable for people of all ages, from infants to the elderly and also those in a fragile state. However you do not have to be ill or have any particular symptoms to benefit from Craniosacral Therapy. The alleviation of life’s stresses and strains giving an increased sense of vitality and well being is welcome to most of us at any time. Venue Church Farm, Dunton. Mon and Fri 9.00am to 6.00pm. Frequency Usually I see people weekly. Generally several sessions are required, when starting out, to feel any benefits. After which we negotiate how many sessions are needed. Cancellations There is a full charge of for missed appointments and a £20.00 charge for cancellations less than 24 hours beforehand. What to expect My style of working combines elements of talking and hands-on contact, usually more hands on than talking. You remain fully clothed at all times and any contact is negotiated beforehand. Confidentiality Developing a safe and confidential space is essential in creating a therapeutic relationship. I regard all the work I do as confidential. Professionalism I am registered with the Craniosacral Therapy Association and abide by their Code of Ethics, Code of Practice and Complaints Procedure. Details of these policies can be found at the following website www.craniosacral.co.uk I’m a fully insured with Holistic Insurance Services. CPD I am committed to Continued Professional Development and attend at least one training course each year. Supervision I get regular supervision which helps support and enhance my work and Therapy and ensures that my practice is safe. I also receive my own therapy.